This ominous EMPERORS ROYAL GUARD figure is rendered in careful detail to look just like the character in the film! Send him on his quest to protect the emperor (other figures sold separately), armed with his sword, blaster and double-bladed pike. Change his look with the included helmets! 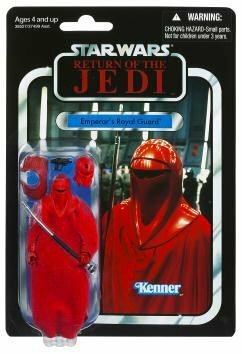 Re-enact your favorite Star Wars battles or create brand new ones with this cool EMPERORS ROYAL GUARD figure!